This ubiquitous Pogo is known by its officially sanctioned common name - the 'western harvester ant'. The range of Pogonomyrmex occidentalis includes major parts the states of Arizona, Arkansas, Colorado, Kansas, Nebraska, Nevada, New Mexico, North Dakota, Oklahoma, South Dakota, Texas, Utah, and Wyoming. It can also be found in extreme southeastern Idaho, and east central California. This ant bears a strong superficial resemblance to Pogonomyrmex salinus. 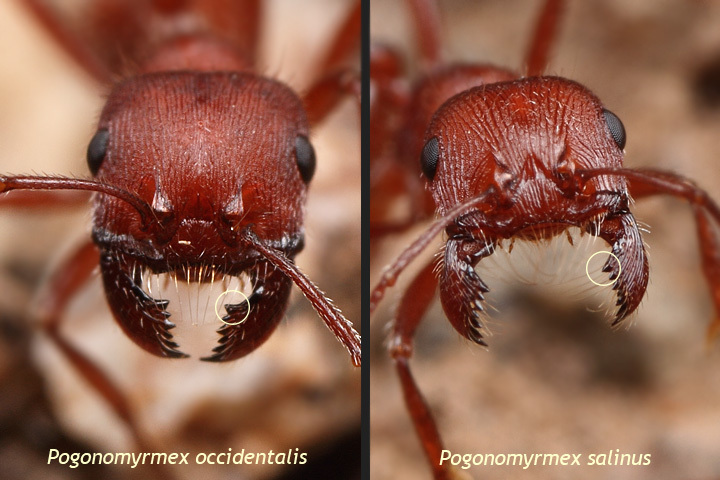 In the areas where the ranges of P.occidentalis and P.salinus overlap (or in a transitional zone), it can be extremely difficult to know which ant you are looking at. Both species are somewhat variable in their hue - ranging from lighter to darker shades of red (or even orangey red, or reddish brown). While P.occidentalis may have a slightly larger average size, we have seen a few nests where most individuals were as small, or smaller than typical, or larger P.salinus workers (P.occidentalis = 6.5 to 8.5mm length / P.salinus = 5.0 to 7.0mm length Taber 1998). Nest structure is also unreliable in the differentiation of these species, as the gravel-covered mounds of these two ants can be indistinguishable. There are other small differences as well, but this feature is the easiest to see and interpret when looking through the viewfinder of your camera, or with a hand lens or field microscope. The workers of P. occidentalis can be extremely aggressive, especially when defending their nest. If one wishes to photograph these ants, it is advisable to arrive at the nest around sunrise, and work with the ants in the relative cool of the morning. As the ambient temperature rises, so does their activity level - making it difficult (if not impossible) to image them, or observe them closely at the nest. 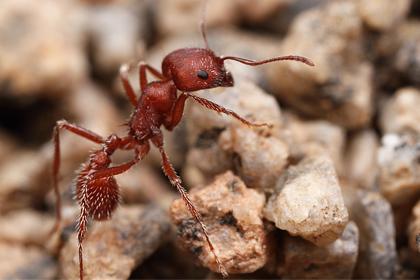 Because of its habit of making huge clearings around its nests, its harvesting of huge amounts of seed, and sometimes causing erosion of asphalt roads with its tunneling/nest building activities - this ant is considered a significant pest in some states.